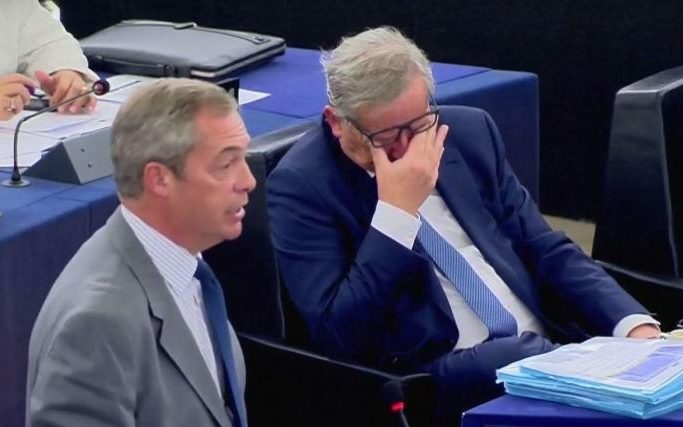 The State of the Union speech (#SOTEU) of president Jean-Claude Juncker resembled himself – pale, drained out of energy, contrasting with confronting him triumphant Euro skeptics Nighel Farage and Syed Kamall. Behalf of the entirely new context there was hardly anything new to the usual mantra of ‘more-more-more EU’ as if it can be a magic remedy to a project in decay. The decision to sideline #Brexit, and go on with “business as usual” was mission impossible: the feeling of contagious effect was in the air. The MEPs expressed concerns about further decomposition of the project under Dutch ‘Prime-Minister Wilders’, and French ‘President Marine Le Pen’. The latter immediately declared her intention to offer #Frexit referendum. However the challenge to #Juncker was coming not only from the ascending right, but form the far left – Gabi Zimmer (GUE/NGL), who loathed #Barroso’s career Resurrection at Golman Sachs, damaging the image of the institution beyond repair in confirmation that Brussels serves the interests of powerful international lobby, but not regular Europeans. Promising ‘growth and jobs’, Barroso in reality secured only his own job oversees next to his lucrative pension. His ethically doubtful move casted a long shadow on his successor’s credibility, already questioned by the Luxleaks affair – Juncker had his own skeletons in closet, while criticizing in #SOTEU Apple company for tax evasion in Ireland. Further #Juncker’s wishes to play a role in global politics, namely in Syria, were no more than fancy dreams – without the UK as member of the UN Security Council and head of Common Wealth – the EU weight internationally would be substantially reduced. The same for HR Mogherini role in foreign policy: before acquiring an international renommé she should become a ‘Prophet in her own land’ – Europe, where two leading EU member-states Germany and France launched Minsk talks without her in attempt to correct the catastrophic consequences of the EU Enlargement policy. Fortunately, the EU had no army of its own to interfere in Ukrainian conflict, but Juncker this time declared his ambition to establish one. The debate around EU defence is not new, even Mogherini’s job name reflects this original idea of the founding fathers of ‘The United States of Europe’ – representing Foreign Affairs and Security Policy, but the second part of the activity never came into reality, except of a few haphazard missions. Réne Pleven plan (1950) of European Defence Community (EDC) singed two years later but not fulfilled in more than half-a-century can hardly be acknowledged as innovative, but in a different context without UK – too loyal to US to consider such a ‘heresy’ – it might have more chances to be realized to some extend with the support of states as Germany, Hungary and Czech Republic. The immigration as the core issue, that according to PM Cameron played a crucial role in #Brexit vote, haven’t seen much of a change in #SOTEU – the solidarity principle applied indiscriminately remains the dogmatic universal tool of Brussels without major change. A few drawbacks on rejection of imposing quotas on countries, unwilling to accept migrants, can’t be considered as a new political line, but rather a necrology to failed attempts to force East Europeans to pay the bill for US failed policies in Africa and Middle East. #SOTEU Acta est fabula, plaudite!